Bill don Moyer was born on June 5, 1934. He is an American journalist and political commentator. He is one of the popular TV news commentators. He has also served in the Johnson administration as a White House Secretary from 1965 to 1967. Having worked as a TV commentator for more than ten years, he has been strongly involved in public broadcasting. Moyers was born in Hugo, Choctaw County in Southeastern Oklahoma. His father was John Henry Moyers and mother Ruby Johnson Moyers. Despite being born in Oklahoma, Moyers grew up in Marshall, Texas. Bill was interested in journalism from his early age, so he began journalism at the age of 16. At that time, he became a cub reporter at the Marshall News Messenger in Marshall, Texas. He completed his study in journalism from the North Texas State College in Denton, Texas. He was employed as a summer intern by then-US Senator Lyndon B. Johnson and later he got promoted to manage Johnson’s personal mail. After that, he joined the University of Texas at Austin, Texas. From there he wrote for The Daily Texan newspaper. He completed his graduation with a Bachelor of Arts degree in Journalism in 1956 and in the same year, he joined the University of Edinburgh in Scotland to study issues of church and state as a Rotary International Fellow. He did Master of Divinity degree from the Southwestern Baptist Theological Seminary in Fort Worth, Texas in 1959. While he was in SWBTS, he worked as Director of Information. From 1967-1970, Moyers worked for the Long Island, New York daily newspaper “Newsday”. He was as a publisher. The publication was unsuccessful that time but after the joining of Moyers, he led the newspaper in a progressive direction. He brought many leading writers such as Daniel Patrick Moynihan, Pete Hamill and Saul Bellow in the publication. He added some new features and investigative reporting and analysis in the newspaper. After that, the newspaper was quite successful and even won 33 major journalism awards. But later, Moyer resigned from the publication because of the issue with Harry Guggenheim. Harry was the owner of the paper. They split over the 1968 presidential election. Harry supported Richard Nixon whereas, Moyers was supporting Hubert Humphrey. Harry sold his share to Times-Mirror Company attempting to newspaper employees to block the sale. 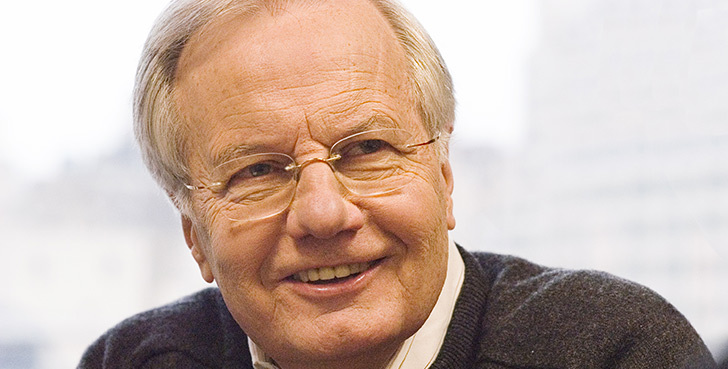 After resigning from the company, Moyers began to work for the Public Broadcasting System (PBS). He started hosting a news program “Bill Moyers Journal”. He ran the program until 1981. The program was paused from 1976 to 1977 and was again started from 2007 to 2010. He restarted the program on April 25, 2007, with his first episode after the interruption. His first episode was “Buying the War”. It was about the general media’s shortcomings in the run-up to the War in Iraq. After the success of his journal program, in August 2011 he announced of bringing a new hour-long interview show called Moyers & Company. The program was premiered in January 2012 and in the same month, his new website “BillMoyers.com” was launched. Later Moyers reduced half hour time of the show. The show was produced by Public Affairs Television and was distributed by American Public Television. On January 2, 2015, the program was completed. While talking about his personal life, he was married to Judith Suzanne Davidson on December 18, 1954. Judith is a producer and they have three children and five grandchildren. Currently, their son William Cope Moyers is a CNN producer, Hazelden Foundation spokesman whereas John Moyers, their other son assisted in the foundation of TomPaine.com. Moyers and his wife are currently living in Bernardsville, New Jersey.